The Shaman, for Native Americans, is the medicine man, the poet and the one who encounters and interacts with the spirit world. To celebrate Native American culture, S.T. Dupont has created this amazing Limited Edition: a palladium finish decorated with tribal American motifs and wonderful pearlised Chinese lacquer with mother-of-pearl inlay. S.T. 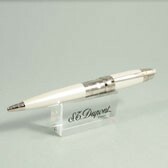 Dupont Shaman Limited Edition consists of five pocket lighters, numbered out of 2929, and a full series of pens, numbered out of 1929.